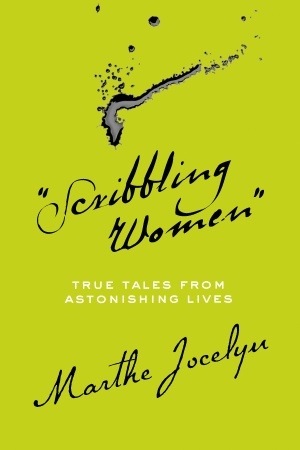 Today I'm posting a review of Scribbling Women by Marthe Jocelyn for the blog tour hosted by Tundra Books. I had the chance to read her historical fiction Folly last year and enjoyed it. When I had the opportunity to be part of the tour for her latest book, I took it. Enjoy! Marthe Jocelyn gives us a glimpse into the lives of eleven very different women with one common bond in Scribbling Women; they wrote. Not all wrote for the public, some never expected their words to be seen by anyone but themselves. They all were women living in interesting times and their stories provide us a look at what life was like then. Some were published authors but others were housewives, ladies, explorers, and criminals. Of course, I personally found some lives more interesting than others. Is it really fair to compare their lives that way? Maybe not, but I had my favorites. One woman I like to think of as the Jane Austen of Ancient Japan. She might not make a great bff but the lady had a quick wit and a sharp tongue. She might not have been popular with other women in the Japanese court but her insights are fun to read a thousand years later. Then there was Nellie Bly who fearlessly threw herself into investigative reporting. She entered an asylum as a mental patient to write an exposé on the horrors inflicted on the inmates. Later she sailed across the world to see if she could go around it in 80 days. Just like the book by Jules Verne! She even had the opportunity to meet Mr Verne during a stop in Paris. It is difficult to sum up the life of a person in a few pages, as a result I felt there was much left unsaid about these women in the book but it's a start. Scribbling Women is a book written for younger readers (age 14 and up, according to the publisher) and is geared toward that crowd. It's an easy read. My tween self would have enjoyed Scribbling Women. I loved learning odd historical facts. I would imagine a young person with a love of history would enjoy it as well and hopefully have them eager to learn more. It made me wonder about my own scribbling as well, will someone in the future be interested in what I write today? At the end of the book, Jocelyn asks the reader to make a list of things we'd be curious to learn more about. Her question made me think of a woman I heard of while I was visiting Niagara Falls, the first person to go over the Falls in a barrel and survive, 63 year old Anna Edson Taylor. She might not have scribbled about it but really what a story! Please visit Tundra Books for more information or Book Depository to order. As part of the Scribbling Women Tour, you have a chance to win a collection of Tundra Books. See the blog Talking with Tundra for details and the blog tour schedule. You mentioned the list the author asks the reader to make at the end of who/what they would like to know more about. I loved this! I do this and love lists and think it is a great way for young readers to begin exploring new topics. I love lists. I make them for everything, and invariably leave them everywhere. I liked Sei's lists and now am on the hunt for more of her material. I would love to learn about more women in times when it wasn't done(Victorian Age maybe)who traveled to exotic places or even just to settle the Wild West. These are such fascinating women. I can't think of any specific woman that I'd like to learn more about. I am interested in those who paved the way for the rights and luxuries that we have today. Not long ago I read a wonderful picture book biography by Margarita Engle called Summer Birds. It was about a scientific illustrator named Maria Merian who lived and traveled in the 1600s, definitely not seen as proper. I love finding about women who made their marks in so many ways. Jennifer- I can just imagine what else Sei would have to say. Jodi- Those would be interesting stories. Teresa- I bet the suffragette women's lives would be fascinating reading. Sal- Another interesting woman I haven't heard of! Kailana- That's what I found- I wanted to read more about them. There are definitely women I want to learn more about, Madame Curie being one of them. Thanks for your review. its true that it's impossible to sum up a life in a few pages but since they say that 'life is in the details' i feel that marthe has chosen with wisdom and sensitivity the particular details to convey the essence of these eleven women's lives. Martha- Thanks for your comment. I love reading the comments about this book. Marthe, I hope you are contacted by some of the university professors teaching feminism classes. It sounds like it could be a great addition to curriculum!